The Fruit Fighter figures have been spotlighted twice: (1) Fruit Fighters and (2) Fruit Fighters Update. Both of those entries showed the figures in the pre-production state. Recently the University of M.U.S.C.L.E. purchased a complete set of figures from Halfbad Toyz (blog , twitter, and store). This may be surprising to some people, but the Fruit Fighter figures are part of Art 300. 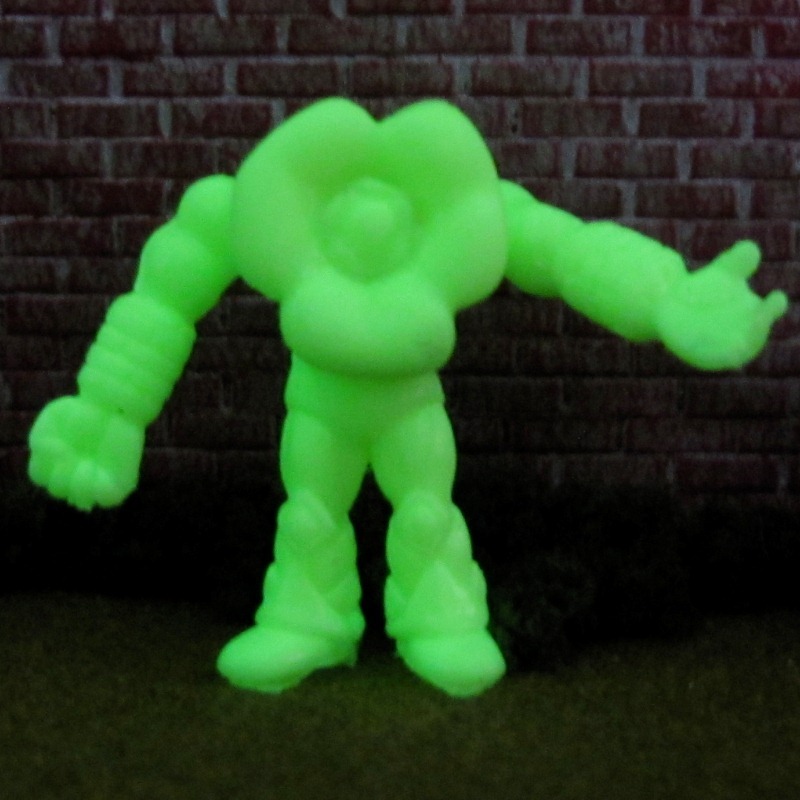 They are not included in Art 200 because they are not attempting to be custom M.U.S.C.L.E. figures. 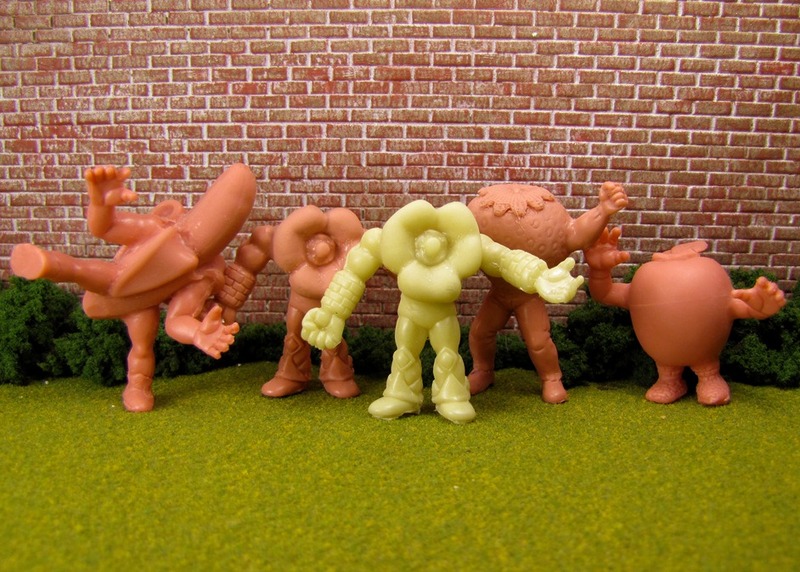 The Fruit Fighters were designed to be an independent group of figures, even if they include M.U.S.C.L.E. figure limbs. 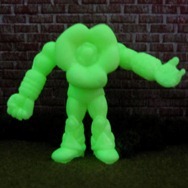 Besides appendages, there is one specific quality that links the Fruit Fighters figures to M.U.S.C.L.E. figures – fun! The Fruit Fighters capture the playfulness and joy of the original M.U.S.C.L.E. figures. Collectible art pieces, like the Fruit Fighters, often fail as toys. Thankfully the Fruit Fighters excel not only as an art piece but also as a wonderful toy. Dr. M.U.S.C.L.E. examined the figures and noted two key features: (1) they were incredibly fun to play with; and (2) the made excellent hero characters – specifically as heroes who could battle HalfBad Toyz’s Yama-Bito custom M.U.S.C.L.E. figures. The grouping of figures is easy to praise as a group. As each figure is examined independently the individual strengths and weaknesses become clear. It should be noted that the figures can be purchased in several colors (Red, Black, Orange, White, Purple, Blue, Yellow, Green, Honey and Flesh). The University of M.U.S.C.L.E. purchased a Flesh set of figures. The first figure to be examined is the Apple. The Apple figure is the smallest of the figures. Very often a small figure lacks additional characteristics that often get attributed to small things (i.e., cute, quick, etc.). The Apple figure does not have that problem. The scaling of the legs and angling of the arms give the feeling of quick movement to the figure. It is easy to imagine the figure moving like a young wobbly child or, perhaps, an Ewok running. The only potential drawback with this figure is that the leaf, at the top of the Apple, feels very delicate. There is no indication that it would easily break, but it does give the impression that extra care should be taken with that part. The next figure is the Strawberry. 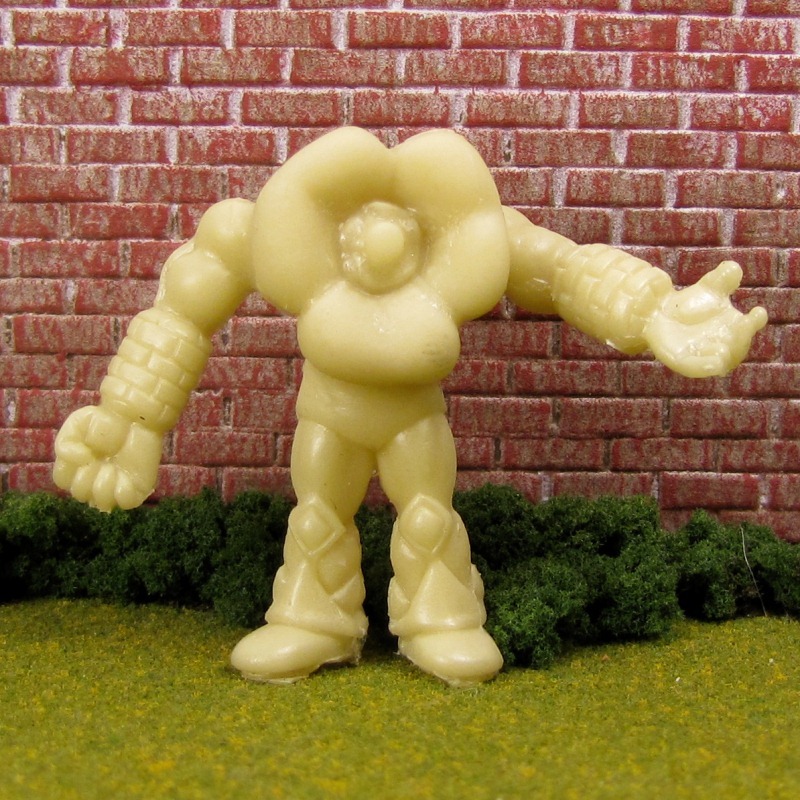 This figure is probably the one that is most recognizable to M.U.S.C.L.E. collectors because of the uniqueness of M.U.S.C.L.E. figure #208. Many M.U.S.C.L.E. collectors dislike figure #208 – specifically because they feel the body and head are effeminate. The Strawberry figure does not share that shortcoming. The Strawberry figure is arguably the most aggressive and masculine of the Fruit Fighters. The arms and legs seem like natural extensions and give the simple Strawberry a more ferocious persona. Following the pattern of moving right to left, based on the picture above, the Green Pepper would be next. Because this figure has a special “chase” version, it will be reviewed last. Instead the Banana figure will be examined. The Banana figure is the most ambitiously posed. 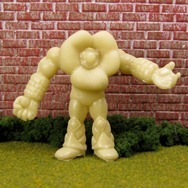 Instead of a more static, standing pose (similar to many M.U.S.C.L.E. figures) the Banana figure is kicking. The other characteristic that makes the Banana unique is that it is slightly peeled. The combination of kicking and peeled gives the figure a tremendous amount of personality. The figure easily emotes everything from comical to adventurous. It is also the figure that evokes the greatest feeling of playability. Children could instantly pick-up this figure and have a sense of the character. Sadly, there is one downside. The figure is incredibly difficult to keep in a standing position. This does not negate the quality or charm of the figure, but certainly adds a layer of frustration. The Banana figure is akin to the M.U.S.C.L.E. figure #107 – easy to love, but more difficult to display. Before the “chase” version of the Green Pepper is explored, the standard version will be examined. The Green Pepper is interesting for a few reasons: (1) it is the only vegetable Fruit Fighter; and (2) it is the only fruit that isn’t in an “upright” position. It is that second aspect that provides the figure a great deal of its character. By putting the top of the Green Pepper facing forward it has created “face” for the figure. 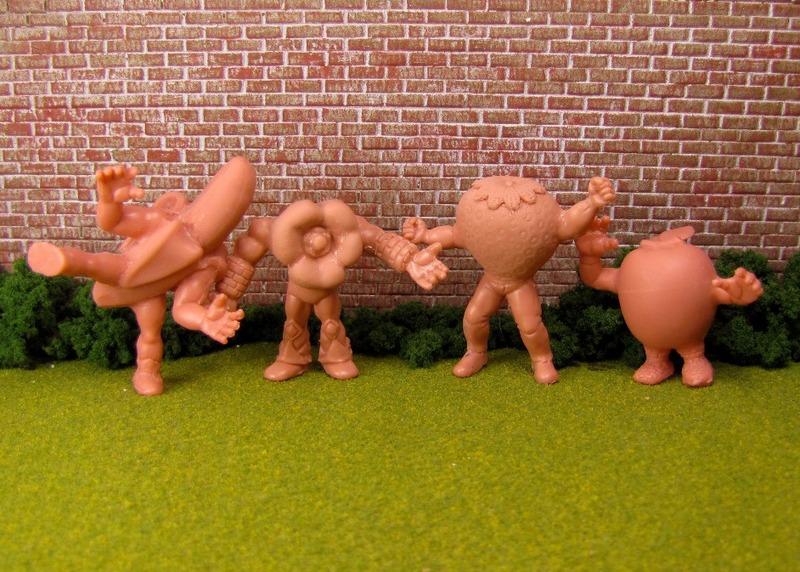 The Green Pepper figure was the hardest decision for Dr. M.U.S.C.L.E. to classify as hero or villain. It was likely the Green Peppers similarity to the other Fruit Fighters that ultimately classified his as a hero. This is probably the only Fruit Fighter that may be able to pass as a villain if viewed alone. The chase figure always has a cool effect: Glow in the Dark, Glitter and more. The chase figure is random, as chosen by us. The figure shares all the charm of the standard figure. In full light the figure appears like a very pale yellow. However, in the dark the figure glow incredibly brightly. Halfbad Toyz has created a wonderful, and currently under appreciated, set of figures with the Fruit Fighters. Not only do these figures thrive as a separate product, they also fit comfortably into the M.U.S.C.L.E. universe of figures. This entry was posted on Tuesday, March 22nd, 2011 and is filed under Art, UofM News. You can follow any responses to this entry through RSS 2.0. You can skip to the end and leave a response. Pinging is currently not allowed. Art 200 Halfbad Toyz: Custom M.U.S.C.L.E. Yama-Bito 10-Pack | University of M.U.S.C.L.E.